Do you ever have to deal with negative people? Do you ever have days where everybody seems to want to bark at you all day long? Under those circumstances, you struggle to keep your spirits up, don’t you? Well, I know the feeling—all too well, unfortunately. People hate debt collectors, period. Representing the company, I politely answered calls from those who questioned their outstanding balances. No matter how or what I said to appease the masses, they would retaliate. They’d yell my ear off and curse at me. And boy, did it take its toll on me. It was like clockwork; my mind was battered and bruised daily. I’d arrive home feeling the ill effects from the entire workweek. I didn’t go out or do anything on the weekends. Depression would engulf me, and I would hit a record low once Sunday afternoon arose. Anticipating work was like approaching the apex of a roller coaster. You know there’s no going back and there’s only one way out … and it’s down this big drop whether I liked it or not. Back then, my plan still was to move up the company’s career ladder, so as much as I loathed the job, leaving it to find something more fulfilling never even occurred to me. Instead, I tried to find ways to cope with all the negativity. Eventually, I succeeded. I developed a safeguard. And even though the work experience wasn’t the best, it did have one positive effect. Prime yourself before walking out the door. Load up with whatever positives you can get before you tackle a new week. Watch inspirational or funny movies, laugh at jokes, read enriching and influential books, listen to uplifting music, or learn from motivational speakers and teachers. Stock up as much positivity as you can, because everyday life can sap you of your precious energy. Your commute, job, unexpected challenges, personal problems, and friend and family issues can take their toll if you’re not prepared. Sometimes, others’ negative vibes subconsciously influence us. It’s not our fault we’re human. If someone is rude toward us, our defenses go up, and we’ll dish out the same in return. We’ll unknowingly become trapped and mirror their negative energy exactly. If someone’s being negative toward you, and you realize it’s influencing you for the worst, make a conscious effort to get back in the driver’s seat and be in control. Instead of mirroring their energy, try to help them mirror yours. Be glad that you’re in a more positive state, and reflect the desired positive outcome back at them. If they raise their voice, you speak calmly. If they’re rude, you act politely. That’s the name of the game. Now it’s just a matter of who caves in first. Maintain your energy, and stay the course no matter what. You’ll know you’ve got them when they start matching your tone. Let me first preface this by saying it is not healthy to always listen to someone vent. You’ll need to set boundaries and not let people treat you like a punching bag, but when you’re dealing with clients or customers, you can’t exactly ignore them. In those cases, just let them vent their frustrations without taking it personally. Realize their problems are probably not with you specifically but with other issues that caused them torment. Perhaps they need to vent their frustrations about the company you work for. Whatever it is, taking it personally would be fruitless. Don’t stand in their way and take the brunt of the onslaught. Just step aside and let them attack the problem head-on to redirect the negativity away from you. That’s how you should visualize it in your head. Remember, they’re not really attacking you. They’re attacking the problem. The problem itself is not a part of you; it’s a separate entity. If they’re angry with you personally because you made an error, put your ego away, be honest about it, apologize, and move forward. Never hide anything. It’ll just make the situation and your feelings worse off than before. Create the least amount of friction as possible by shifting the negativity away from you. If you do find yourself disagreeing with someone, make the best of it by trying to find a point they thought of that you actually agree with. Then genuinely take the time to compliment them for their idea. Doing so will subconsciously create a small bond. Believe it or not, this micro-connection is a tiny foundation that you can build upon for a better relationship in the future. It’s always best to come out of a conversation on a good note rather than leave any potential seed of negativity. A gift to yourself (it doesn’t necessarily have to be material) is the perfect distraction to help shift your mindset and lift your spirits when you’re down. You should give yourself a reward, even a small one, at the end of the day or week. For example, it could be as simple as pre-ordering a book that’s piqued your curiosity or perhaps scheduling a dinner with someone you’ve wanted to be closer to. Whatever it is, it gives you something mentally positive to hold onto and think about to make it through a tough day. You’ll have to deal with a certain amount of negativity in your life. You can’t really change that. Negative people exist, and even the positive ones can succumb to negativity on a bad day. 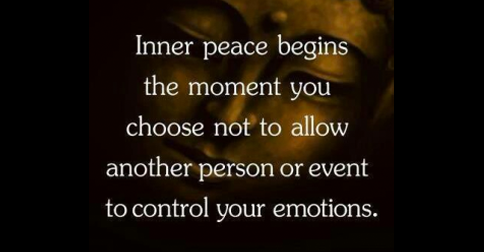 But you can change how you deal with it … if you allow yourself to. You can change how you react. Is it easy? It can be. Is it challenging? It can be. The real answer is actually up to you. At its very core, negativity is how you perceive it. You can choose to keep your spirits up no matter what negative people throw at you. And maybe you can even change their moods while you’re at it. Is it worth the effort? Unequivocally yes. I gained this valuable life skill that I undoubtedly couldn’t get anywhere else, and I use this skill to this day. Take control of your life, and lead it where we want to go. Don’t allow others to dictate how you should feel. That’s something you can do for yourself.